There can never be success in any education system if the enrolment and transition rates are not consistent. The County Government, in recognizing this fact, embarked on a programme that would ensure that enrolment is improved and enhanced while boosting class attendance. Scholarships and Bursaries have been disbursed to over 25,000 students across the six sub counties to access education. This project has targeted special needs, secondary, college and university education. This has improved access to education, improved transition rates and increased the number of students in the school facilities. 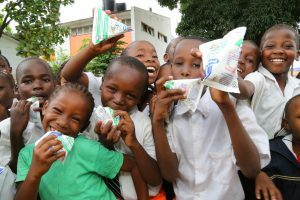 School milk program to all the 97 public schools and so far benefits over 30,000 children, 5 days a week (All Wards), leading to improved enrolment, class attendance and information retention among the children. Early Childhood Education (ECD) is the responsibility of the County Government and as such providing the requisite environment for learning becomes an integral part in the implementation of the programme. Consequently, the department of the County has overseen the construction of 8 brand new ultra-modern ECD centres across the sub counties which has improved transition rates and set a solid foundation for the children of Mombasa. Likewise, the County has employed about 100 teachers into the Early Career Development Centres. The County Government values knowledge and skills development and for this reason 23 Maktaba centres (libraries) in 23 wards where students enhance their knowledge, skills and have their talent identified and nurtured. These libraries have enabled access to information and are entrenching a reading culture among the youth. Partnership with Mombasa county polytechnics has seen over 2,000 youth benefit from tertiary education.